As a subscriber to the SPE , you will receive occasional messages from one of our sponsors. You may unsubscribe from future sponsor e-mails by clicking here . Developing tooling and processes before cutting the steel of a mold significantly reduces the money and time spent during the ramping-up process of new parts. 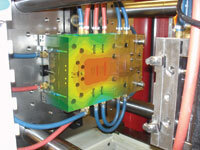 Traditionally, simulation was limited to the design phase of a new plastic part, as the software tools had only limited capabilities to consider the mold and process steps. They were also difficult and time-consuming to use, making them inherently un-fit for the fast-paced production environment. SIGMASOFT® is the first plastic simulation tool that has the capability to simulate all process and mold details, reflecting the impact of all process and molding relevant parameters on the quality of a part - accurately. The combination of ease-of-use, without the need for “finite element meshing” expertise, and its “speed-to-solution” complement the part, process, and mold development process at the molder. SIGMASOFT® can also simulate elastomers and LSRs, a unique capability. Read recent articles written by our customers!